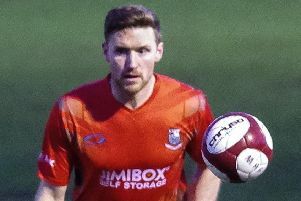 Neil Reynolds is hoping an ultra professional mindset will help Bamber Bridge get their NPL Premier Division campaign off to a flying start. The Brig boss has revealed this week that his players are training virtually every day as they look to hit the ground running following their promotion from the NPL First Division North. Opening up with an away game against Grantham Town on August 18, Reynolds believes his men will be the fitest they have ever been when the first whistle sounds. “The fitness levels of the players have come on,” said Reynolds. “I am treating us like a professional team – the lads will tell you. “We’ve been in five times this Saturday, Monday, Tuesday, Wednesday, Thursday. “There’s no let up. The lads want to be right. “I’ve just said that to the lads – I know is a big commitment, I know it’s only pre-season but it’s a big league that we are going into. “The lads’ fitness levels have got to be right up there for the way we play. It is a crucial time. It’s the first time we have done anything like this. “The lads are buying into it. They want to come into training and if they want to come in to training, I will be here. After losing their first four pre-season games to Preston, Morecambe, Squires Gate and Everton Under-23s, Brig picked up their first win at the weekend when they defeated Padiham 2-1 at the Sir Tom Finney Stadium. This evening Brig face Longridge Town at Fulwood Amateurs’ ground in Lightfoot Lane. They are at Charnock Richard on Saturday.